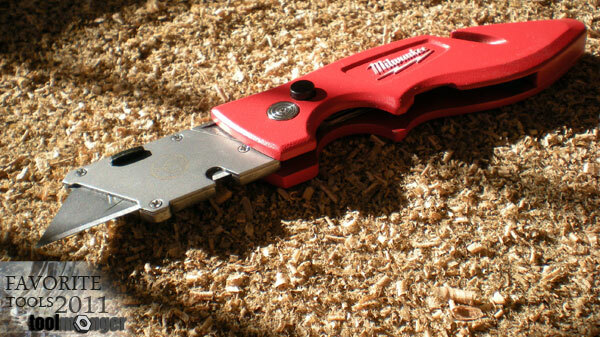 I really hated being wrong about the Milwaukee fastback folding utility blade. I thought it would be one of the also-rans that always crop up around Christmas as a “Free Gift” in discounted toolkits. Leave it to Milwaukee to follow through with their threat to put muscle behind their hand tool development and make me feel like a jackwagon. The fastback has proven to be a hardworking addition to the shop, office, automotive garage, and home area. Mention of its name is followed by a reach into my sidepocket instead of a run to the toolbox. It’s a subtle but distinct difference that speaks more to how comfortable it is to carry and use than tales of its battle prowess ever could be. In the end, it’s a handle for a razorblade — the same cutting edge that can be found in every other blade extension out there. Some fold and have push-button locks that give a pleasing snap like the fastback, and others can be found marked 50 cents in the miscellaneous bin at the big box. Both will cut well, but on occasion you get a hold of a knife like the fastback that feels comfortable and immediately forms to your method of work. I like the new DeWALT folder better because it also retracts. I had the Milwaukee for about a year before it “vanished” from my truck box. Worked great though and I would have bought another one had I not seen the DW. Is it easy to swap blades? I bought a big box store brand folding utility knife/box cutter and it pissed me off how complicated it was to put a new blade in it. I cut a lot of cardboard which dulls blades fast. It is super easy to swap. It is the small horizontal black button out near the blade. Easy to push and the blade comes right out. I still don’t understand why people are still using these kind on utility knives. The point is the part that dose most of the work yet they dull so quickly. I prefer the snap type blades. they expand and retract to your desired length, are great for slicing though thicker materials like foams and insulations. They can be bend against the surface to be used as an impromptu scraper, and they have 10 sharp points on each blade. AND they are very easy to change if you get the good knives with the cartridge that holds 5 auto loading blades. Makes no sense to use all these gimmicky versions of the basic outdated stanley knife. I agree! I bought a Stanley retractable because of the cool factor but it spends most of its time in the tool box.I always have the small Olfa stainless steel auto lock 9mm Utility knife in my pocket. BTW If you order the special Ultramax Ultra sharp blades you can upgrade cheaper knives. Mine sits in the tool box. Can’t compare to the blue Kobalt with a Stanley carbide blade. The only quick change knife I have that has not fallen apart. +1 on the snap off blade knifes, I bought a bunch of Olfa knifes at Lowes on clearance. One problem, sometimes if you have to cut hard with them “ting!”, at least your back to sharp. I like the new DeWALT folder better because it also retracts. I would love to hear your reasoning behind this, I dislike my Stanley version of that knife for exactly that reason. It gets really old for me to both unfold and extend the blade and vice versa after use. The only benefit I see is that it takes up a shorter space in the tool box/pouch. I still don’t understand why people are still using these kind on utility knives. I do use both, and I find that often snap blades snap at a time when I would prefer that they didn’t. Even using the heaviest bladed snap knives I can find. I do prefer snap bladed knives for finer work, especially for the stuff that is heavier than I would like using an X-acto knife on. Wish there was a preview button for posts so I could get my tags right. I switched to the Milwaukee several months ago, and doubt I will ever use another brand. Press the button, flick the wrist, the blade end locks in position. When it’s time to put it away, press the button and flick the wrist, it goes away. It’s harder to explain than it is to use. There’s a video review of it on Amazon, which helps. The only criticism I have is that the clip on the side is a little flimsy. Other than that, the thing is amazing. Does the lack of blade storage on it bother you? It’s the reason I got the DeWalt instead of the Milwaukee, even though I love Milwaukee. Doesn’t bother me any. The handle is thick enough though to maybe hide a blade or two in a future revision. YEah the belt clip on this is crap. while the knife is easy to use the cheap bent wire clip on the side wont grab onto my belt or pocket after only a few days of use. got one, like it a lot, its my favourite. easy to you use and the flip open thing is real handy !! These knives are great, have one on my side daily. I tried the new carbide blades from DeWalt/Stanley in mine. Although the blade is supposed to last longer, it isn’t worth the extra bucks over the cheapies. I bought one when they were first profiled here and posted about the one issue I had in that thread. It is resolved and this knife is always in my pocket! lack of blade storage doesn’t bother me. I’ve got spares in my shop, where I spend most of the day. I’ve got spares in the tool box I take with me to my night job. I’ve got spares in my truck for any other time. But it’s no big deal. When I need a fresh sharp blade, I just flip the one that’s already in the knife, and when I get back to the shop, I swap it out for a fresh one. So 99% of the time, the unused side of the blade is new. I can’t believe anyone replaces the blades on utility knives. I just sharpen them on a small stone, and get ten years or more out of a blade. You don’t even have to take them out of the holder; just touch them up on a small medium-fine stone if they start to dull. Been doing this for forty years. After you sharpen the blades you can’t reverse them. I love, love, love this knife. Had one since they first came out. It is so fast to just whip out make a quick cut and slip it back in my pocket. People are almost startled though at how fast it deploys. Switchblade fast. It’s a serviceable knife too. Philips fasteners hold it together, no rivets. A note on the sharpening issue: I keep a small draw-through carbide sharpener in the van, and a couple of quick swipes cures the damage from hitting a staple hidden in cardboard. It doesn’t affect the shape of the blade enough to cause a wobble when you eventually reverse that blade. This is not the type of sharpener to use on a good knife, but it is fast.